I’ve never read your work before, where should I start? I’m best known for my Riyria stories which consist of ten stories told in two separate series. I personally recommend reading in order of publication which means starting with Theft of Swords (an omnibus edition that contains the first two books in the Riyria Revelations series). If you prefer your stories to be read chronologically, then you would want to start with The Crown Tower, which is the first book of the Riyria Chronicles. The two series were written in a way that no prior knowledge of one is required for the other. 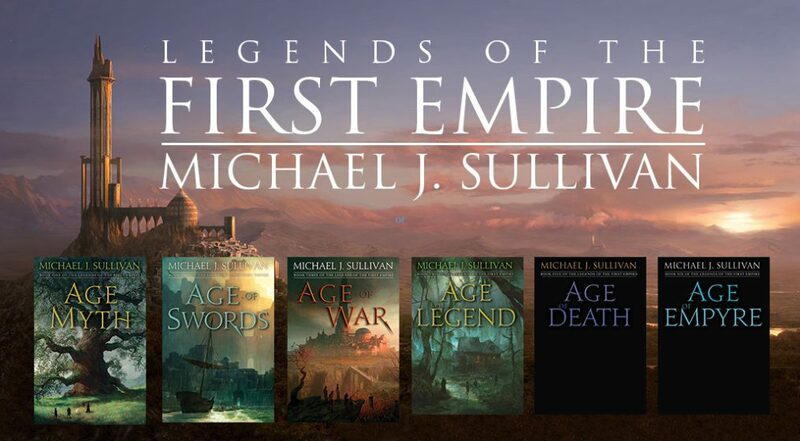 That said, many people have been starting with Age of Myth, the first book in the Legends of the First Empire series, and that seems to be working nicely as well. When is your next released book? Age of Legend is due to release in April 2019. Age of Death is scheduled for October 2019, and the final book (Age of Empyre) in April 2020. Other upcoming releases include the retail release of The Disappearance of Winter’s Daughter (Riyria Chronicle #4) in October 2018. What are you working on now? Currently, I’m working on the first book of a new series (The Rise and the Fall) while waiting on a few minor tweak notes for books #4 – #6 in the Legends series. A fairly large restructuring of the fourth book (as well as adjustments through the end of the series have been completed, and now it’s just down to the final polishing of those books. You’ve been both self and traditionally published. Which is the best? A lot of people will tell you one is better than the other but the fact is they are both have positive and negative aspects. It really depends on the author’s goals. So while there might be a “right choice” for an individual author, there is no “right choice” for all authors. How do you feel about piracy? Well, certainly if I have my choice I would prefer people to buy my books. Not only for myself, but to help pay the salaries of all the people that earn their livelihood (at least in part) from them. Editors, artists, layout people, the folks in sales and marketing all have to eat too. I also realize that there is no stopping it, and that obscurity is a worse problem for authors than piracy. In many ways I feel good that people care enough about my books to pirate them…and I hope they contribute at least in some small way by writing a review or recommending to others. Where can I find a list of characters from the age of myth and their description? I audiobooked the first book but I am lost in the names. Please help quick ! Book is great and I can’t wait for more! The book has a glossary and I just added it to this site. Here is the link. I’m reading Book One and having trouble putting it down. I keep hearing the word “asicker” apparently used for clothing but I can’t find it in the dictionary. What is the true spelling for this word?